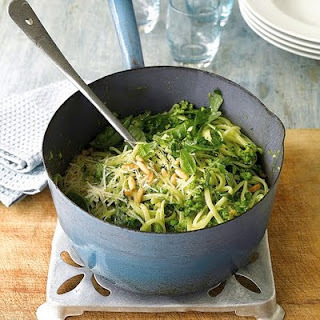 The creamy avocado and pea pesto is a real weeknight winner ­– eat it on wholemeal pasta or spiralised courgettes. This amazing sauce can be made while your pasta cooks, and any leftover pesto is great as a dip. Avocados are a good source of vitamin K, which may help slow joint deterioration. If you don’t like them or find them tricky to cut up, swap the avocado for vitamin E-rich pine nuts or almonds instead. Place all the ingredients in a jug or bowl and whizz with a stick blender. Serve over pasta.